Only nativity scenes from Uganda are shown on this page. Fair Trade Uganda Africa nativity scenes. 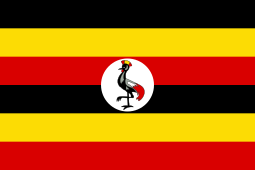 Uganda is a country in East Africa. It is bordered to the east by Kenya, to the north by South Sudan, to the west by the Democratic Republic of the Congo, to the southwest by Rwanda, and to the south by Tanzania. Famously called the Pearl of Africa by Winston Churchill, it is home to one of the most diverse and concentrated ranges of African fauna including the highly endangered mountain gorilla and the endangered common chimpanzee.